If you think you may have a termite infestation, contact us now to quickly get rid of the problem. Termites are the worst kind of pest to have in your home and they will cause massive amounts of destruction if the problem is not addressed immediately. SK Pest provides termite removal services to homeowners throughout New Haven, Milford, Orange, Branford and the surrounding area. How can SK Pest help you remove termite infestations? Identify if the infestation is termites or ants. Inspect the structure to determine where there are nests as well as the points of entry from outside nests. Apply Liquid Termiticides and Termite Baiting Systems, SK Pest will discuss solution options that will eliminate your termites while meeting your needs. Termites are social insects that live in organized colonies similar to a beehive. Termite nests are highly structured communities where termites are split into two major groups according to their reproductive ability. 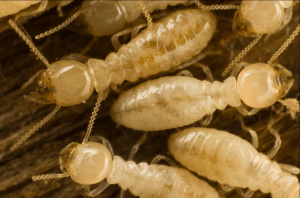 The sterile termites are wingless blind workers and soldiers who stay underground to do the heavy lifting such as foraging and nest-building. Termites are “social cockroaches” that evolved from a common stem with cockroaches about 220 million years ago. Although termites are often called “white ants” because of their pale color, termites are developmentally related to cockroaches. In fact, ants are the primary predators of termites. 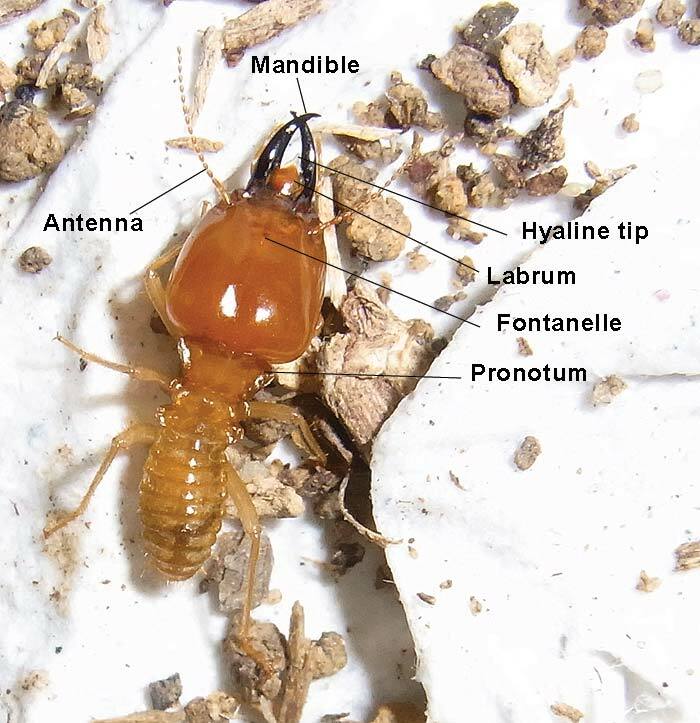 Termites are also grouped according to what they eat. These groups include grass-eating, subterranean, soil-feeding, dry-wood, and damp-wood eaters. The subterranean and dry wood varieties cause most of the damage to homes and buildings. Termites eat dead plant material including cellulose and wood fiber. Man has replaced much natural vegetation with crops and homes all of which provide termites with substitute vegetation in one form or another. Termites are able to consume any wood-derived material including building timbers, books, and packing crates. If it is made of wood or paper, termites can eat it. Their capacity for destroying dead plants knows no bounds. They are notorious for the damage they can do to buildings and other wood products. Termites are small, soft-bodied, and usually pale-colored. The antennae are relatively short, straight, and threadlike or beadlike. Flying forms have two pairs of wings of equal length. The wings are often much longer than the body; however, short-winged forms also occur. Unlike ants, termites never have a constricted “waist” or elbowed antennae. Often, homeowners first encounter termites when the young kings and queens swarm from the nest. The first question homeowners want to resolve is what they dealing with – termites or flying ants. What is the difference between a termite and a flying (winged) ant? Ants have a narrow, wasp-like waist (more “cinched” in the middle of the body). Termites do not have a defined waist. Ant wings are about equal to the body size, with the fore and hind wings of unequal length. Termites have four wings of equal length that are nearly twice as long as their bodies. Ant antennae are L-shaped, with a “bend,” while termite antennae are straight.